I remember running through forest as a kid. I remember the thrill of getting as lost as I could, stumbling upon hidden glades and streams and fields. I remember the rush of a world that was so much bigger and more beautiful than I had hoped — and the harmony that came with getting to know it. It’s a feeling I’ve sought to recapture many times over the years, generally through the medium of video games. Discovering a game that offers a big, beautiful, rich world to explore is one of the true pleasures of gaming. It has fueled the modern obsession for increasingly large and increasingly complex open worlds to roam, but it hasn’t necessarily been successful in recapturing the joy of exploration for exploration’s sake. I captured snatches of this childhood feeling while playing Skyrim, Fallout and Shadow of the Colossus, but I thought perhaps it was something lost to me through the haze of age and experience. That is, until I played Zelda: Breath of the Wild. No game has ever made me feel so much like a child again. I can barely fathom how reinvigorated I am by the lack of map markers and the sparse offering of advice. It’s like a migraine I didn’t know I was suffering from until it went away. It begins the moment you start the game, with only a few controls and a vague sense of purpose to guide you. You’re left entirely up to your own devices after you emerge from a long slumber in a mysterious temple, though the initial section of the world you have access to is cleverly constructed to funnel you in certain directions. Do you want to collect every mushroom in sight (you don’t know what they do yet, but they look pretty)? Do you want to climb the sheer rock face behind you in a vain attempt to reach the top (your stamina is too low)? Do you want to jump down to your death from atop the cliff in front of you (you don’t have a parachute)? You can do that, and that, and that. It’s less hand holding, more standing several metres away with an encouraging wave. I was only an hour or so in when I found my first Sheikah tower, huge landmarks that serve as viewpoints across the land a la the Borgia towers in Assassin’s Creed: Brotherhood. But instead of the towers illuminating a hundred or so tiny markers on your map to indicate areas of interest or quest starting points, all you get is the bare map. There’s nothing on it — not unless you stand atop the towers and manually search out places in your view that you want to explore, pinning them to your map like the explorers of yore. It’s delightfully refreshing. Quest markers don’t appear on your map until you speak to the right people and suss out exactly what your next goal should be. In fact, your map in general is empty until you begin searching, exploring mysterious-looking valleys and promising-looking lakes. To start you have only the land itself to guide you. And what a land it is! There’s so much filling it, but not in the manner of many open world games these days that are “full” of fetch quests and recurring events (I’m looking at you, Final Fantasy XV). There’s always something new to discover, whether that’s a beautiful vista, a type of Korok puzzle you’ve never come across before, or a powerful new enemy. The cycle of night and day, as well as the weather, makes every inch of the land transmutable and exciting: you never know how you’re going to experience it this time. Speaking of Koroks: they’re perhaps the figurehead of what makes Breath of the Wild so enchanting. If you don’t know, the Koroks are a tree- and trick-loving race of adorable woodland critters. They cover their faces with leaves and say cute things like “I must dance!”. 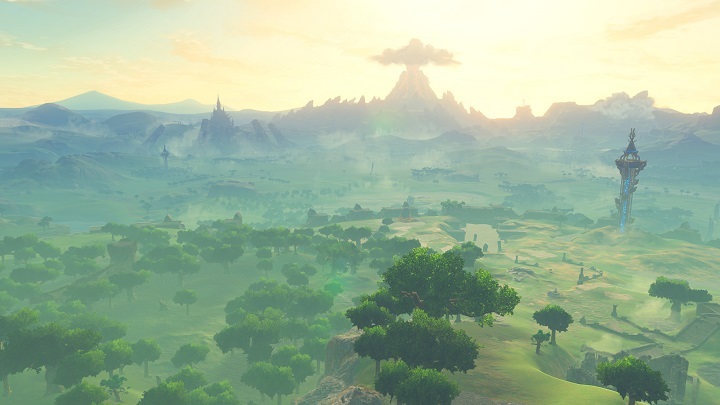 There are 900 — yes, 900 — hidden Koroks scattered around the world of Hyrule. Find them and you receive seeds which can be used to increase your inventory size. It’s a simple reward system that encourages you to uncover the elaborate ways the creatures hide themselves, often more for the fun of seeking than the actual reward itself. Unlike so many collectibles in other games, they work because they aren’t marked on your map — you simply stumble upon them in your travels and get more and more adept at spotting them — and the benefits you get from them can be unlocked immediately, rather than waiting to find the whole set first. Oh, and most importantly, searching for them is actually fun. You get rewarded for random exploration, and thus, random exploration becomes more and more enjoyable. Who knew? My first true wow moment with the game was when I discovered my first shrine quest. The clue to reveal the shrine says you must mount “a beast that wears a crown of bone”. In the field where I was standing there was a herd of deer some way off in the distance. I had already ridden horses, and I knew the process of sneaking up on a wild one so you could jump on its back and attempt to tame it. I thought I was probably crazy, but for the fun of it I tried sneaking up on a buck. I succeed. On its back I looked majestic as anything. I had solved the riddle, and the shrine appeared, but I hardly cared. I was so amazed by this wonderful discovery I’d made in the process: I could ride a deer! What else might I be able to ride?! In this game you’re constantly rewarded when trying new things, pushing further and searching farther. Perhaps the most wonderful thing about exploration in Breath of the Wild is that it becomes a part of the story, not just a random disjointed mechanic. To unlock Link’s memories and piece together what happened a century ago you must travel to 12 specific locations in Hyrule. The clues you get to help you find them? If you said ‘not map markers’, give yourself a pat on the back. All you have to track down the locations are their photographs. To decipher their meaning you must use your knowledge of the map, landmarks in the photos and some educated guesswork. It’s beautifully implemented and just so wonderfully different from what we’re used to in modern AAA games — when you hunt down a location it feels like you’ve really earned it. Link’s exploration of the land is vital to his search for his memories, which in turn mirrors Zelda’s search for her purpose and power as those memories are unlocked. But even with all this reward-based motivation to encourage me to search every inch of Hyrule, it’s actually something else — something deeper and more primitive — that most compels me to keep exploring. Love and care has been poured into every inch of the world. I want to drink it all up, to witness every beautiful sunrise and stumble upon every hidden monument. Maybe this is the closest video games come to food for the wandering soul. It adds up to a sense of wonder and excitement I haven’t felt in years. Hyrule is alive — filled with beauty ripe for discovery, not cheap trinkets to be snapped up en route to a more important quest. I hadn’t realised how poisonous the trend of superfluous map markers was in gaming. I hadn’t realised how much pointless collectibles make me want to do less exploring, not more. But this game makes me want to spend hours running and climbing and jumping, not to fulfil any quest but just for the pleasure in and of itself. It leads to lovely moments of sitting down and zooming into the map to inspect every nook and cranny for secrets, whooping whenever something out-of-place that warrants further exploration is found. I’m over halfway through the game now, and I still haven’t fully unlocked my map — not only because the game world is huge, but because I don’t want to. I’m afraid of losing that feeling of there being ever more to discover. It’s ridiculous, because unlocking your map is only the first tiny step in uncovering everything the world has to offer: but still. There’s something illogical but irresistible in me that wants the wonder to go on forever, the fields to keep on rolling, the forest to never end.